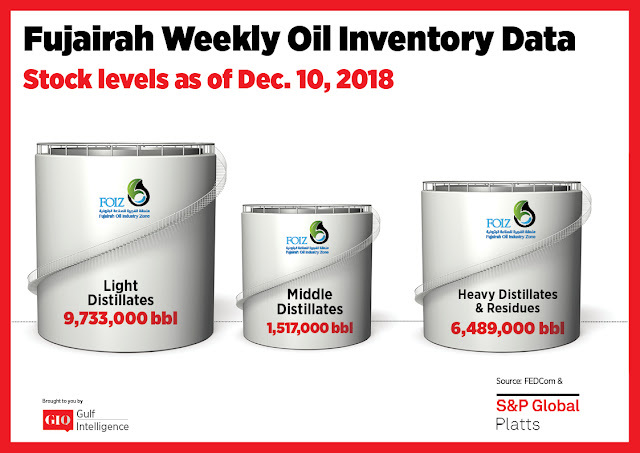 As of Monday, December 10 total oil product stocks in Fujairah stood at 17.739 million barrels – down by 3.2% week on week. Stocks of light distillates fell by 2.7% week on week to 9.733 million barrels. Stock levels are at elevated levels – up by 33% from the year to date average and by 114% compared to a year ago. Gasoline markets remains in the doldrums globally. Sentiment in the East of Suez gasoline market remained sluggish at the start of the week as concerns over regional oversupply persisted. "I can't see any supportive factors this winter. Fundamentals and cracks are still weak. The situation is still the same [bearish]," said a Singapore-based market observer. Stocks of middle distillates slumped by 34.6% week on week to 1.517 million barrels – a 12-month low and the second lowest total on record. Stocks were last lower at 1.212 million barrels on December 4, 2017. The gasoil arbitrage from East of Suez markets was still open and an increased number of Long Range tankers with ULSD have left the Middle East and India to come to Europe this month according to shipping sources and Platts cFlow, trade flow software. The East-West gasoil exchange-for-swaps (EFS) was at minus $14.19/mt yesterday. Stocks of heavy residues rose by 8.1% week on week to 6.489 million barrels. 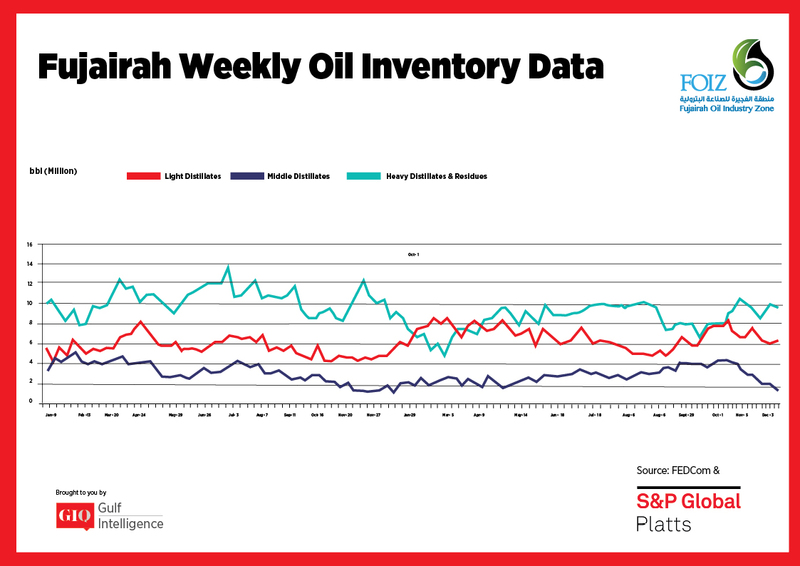 Bunker demand in Fujairah was little changed the week as crude prices stabilized following production cuts agreed by OPEC and other producers last Friday. However, bunker fuel premiums in Fujairah remained relatively high on lower availability of cargoes in the market. 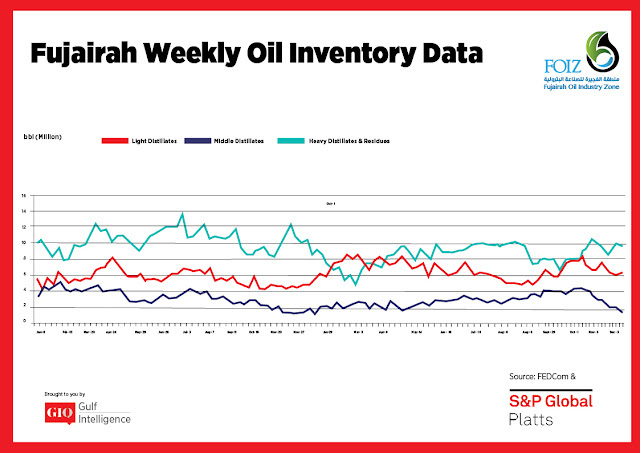 The Fujairah ex-wharf 380 CST premium to the Mean of Platts Arab Gulf 180 CST high sulfur fuel oil assessments was at $13.42/mt Wednesday compared to an average of $5.76/mt since the start of the year. "December supply is looking to be slightly tighter as it's traditionally a month where people don't have enough cargoes to sell," a Fujairah bunker trader said.